December 15, 2013, 11:39 AM · Editor's note: Today is the anniversary of Walt Disney's death, in 1966 at the age of 65. In honor of Walt, we offer a history of what might be his most popular accomplishment — the Walt Disney World Resort. When the Magic Kingdom opened its doors in 1971, it marked the beginning of an era for Disney, the theme park industry, and the state of Florida. The park would eventually eclipse its predecessor, both in size and popularity. The modest sized city of Orlando would quickly be transformed into an international city visited by more than 50 million people per year. Disney World's opening is a story over 10 years in the making. It involved a near five-year search for a site, secret land dealings, questionable business tactics, controversial political deals, a gargantuan engineering feat, and the death of Walt, the heart and soul it all. Disney World was not built as intended, meant to be not just another theme park, but also a city that would be a model for the future. While Walt's utopian would never come to pass, a different kind of utopia…the self proclaimed "Happiest Place on Earth" would be built in its place, and with it a piece of American culture that would eventually inhabit the world. By 1958, Disneyland had long since gone through the early growing pains. Walt's ever expanding vision combined with imagination and some trial and error had transformed the industry. Just ten years before, the company had been struggling in the post war economy and was in financial turmoil. Disneyland alone had reversed their fortunes and the company was flush. It wasn't long after Disneyland's opening that there was talk of the possibility of opening another park. NBC was the first to approach Disney in this manner. Together they put together a study on the possibility of opening a park in New Jersey. The idea was canned because the climate would only support a short seasonal operation. A dozen other venues were considered over the next few years, some of them foreign, most of them east of the Mississippi, after another study concluded that less than 5% of Disneyland visitors were from the eastern half of the U.S. while 75% of the population resided there. Of all the early venues, St. Louis was the one that was the closest. After several meetings with city officials, plans began to form for a downtown indoor park in 1963. The accounts of why this never happened vary. One legend is that Walt decided against the project after being insulted at a dinner party hosted by local St. Louis politicians and businessmen. It was there in early November 1963 that August Busch Jr. foolishly challenged out loud Disney's policy of no alcohol in the park. "Any man who thinks he can design an attraction that's going to be a success in this city and not serve beer or liquor ought to have his head examined." Walt was likely highly offended at this statement. He was a self-made man, and a successful one at that. He would have hated being called out like that, especially in a public setting. The next morning Walt and his associates were gone…the deal was off. While this little exchange might have played a factor in Walt's decision to pass on St. Louis, he also had his eye on other locations. For a while now he had been eyeing Florida as a possible site for his next project and had decided it was the place. Palm Beach was studied for a while, but it was Walt's ride over Orlando in a borrowed plane on November 22, 1963…the day JFK was shot, that planted the seeds for Disney World's birth. 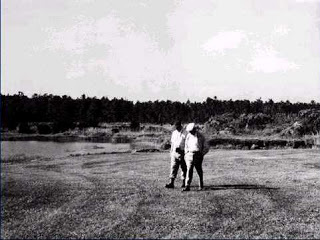 Walt saw two things that day in warm sunny Florida…acres and acres of empty land away from the oceans, and a highway system that could feed the massive amount of visitors needed to sustain the project. For Walt, this particular project wouldn't just be another Disneyland, but something much bigger. Disneyland was no doubt a giant success, but that success had brought others. The park, once an escape in the middle of orange trees, was now surrounded by traffic, cheap motels, restaurants, and neon. This time it would be different. Walt didn't want the magic to be compromised. It would be not just a theme park, but also a community, a "city of tomorrow" where people could live and work. Walt had taken great interest in the idea of a planned community, and the Florida project would have to be shielded from the rest of the world. To accomplish this feat, Walt needed land, lots and lots of land. But again this wasn't Disneyland. Disneyland was a startup that was not only an unknown quantity, it was also a predicted failure. A few hundred acres had come pretty inexpensively to him then, but it was not nearly enough for this venture. For this they needed much more land. Being the shrewd businessmen they were, Disney and his associates knew that the prospect of the Disney Company purchasing thousands of acres could be an expensive one. Disney's success had made them high profile in the media, and if word got out that they were buying land, speculators would come and the price would skyrocket. This venture would have to be a secret one. And so it was that "Project X" was born. Walt and his associates carefully selected a team within the company, and went so far as to set up secret phone relays, delay the official hiring of top level officials (keeping them as "unofficial consultants"), and also to number the internal memos so they could be tracked. They very carefully selected Paul Helliwell, an ex military intelligence officer turned lawyer, and Florida realtor Roy Hawkins to be their eyes and ears in Orlando. The Disney officials who conferred with them used fake names. Everyone was kept in the dark, right up to the Florida state government. Several dummy corporations, all of which are immortalized on the windows of Main St. were set up to make land purchases. Some were official sounding enough (Latin American Development and Management, Bay Lake Properties, Tomahawk Properties), others were a bit of an inside joke. Retlaw (Walter spelled backwards), the Ayefour Corp. (I4), and M.T. Lott Real Estate were also used. Using these corporations and Helliwell's firm as a third party, they began the long process of buying land. The first tracts were bought for $80 per acre…an astonishingly low price from today's perspective. Naturally, local officials, citizens, and the press began to take notice of the giant land grab. As each deal was finalized, speculation grew as to who the mystery buyers were. Several large industrial companies were thrown about as the potential buyers. At one point, a TV station announced that the buyer was Ford, only to announce the next day that it was a hoax. Disney was one of the companies in the mix, but Walt continued to deny any involvement. As the media buzz in Florida continued to grow, little cracks began to form in the façade. A grocery store clerk quoted to the Orlando Sentinel that "strange men from California kept coming to get sodas from him". Another time, Walt himself was recognized by a waitress. He then cooked up a story about how his parents had been married there and he was taking a "sentimental trip". During a press gathering for Disneyland's tenth anniversary, Walt was blindsided by Orlando Sentinel reporter Emily Bavar. After being asked why he was spending time in the Orlando area, he froze and then babbled on…neither confirming nor denying anything. He had tipped his hand. Bavar was now suspicious, leading her to key in on Disney as the likely suitor. Some weeks later on October 21, 1965, Bavar published a story in her column predicting Disney as the buyer and a new theme park being built in Orlando. 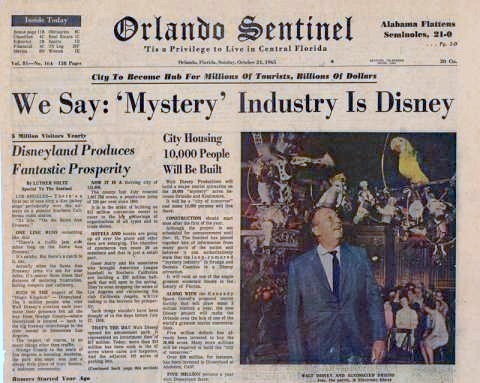 Three days later in the Sunday edition, the headline read "We Say Mystery Industry is Disney." By the time the front page headline was printed, Disney had purchased over 27,000 acres of rural Florida swampland stretched across two counties, almost tripling their initial goal of 10,000. The average cost…$200 per acre. By the end of the land grab the cat was out of the bag, and the price had ballooned to $80,000 per acre. Disney's reasons for the vast land grab were many-fold. One was the ability to shield his park from the outside elements that had strangled Disneyland. The other reasons had less to do with theme parks and more to do with availability, politics, and the "city of tomorrow" project that Walt was planning. 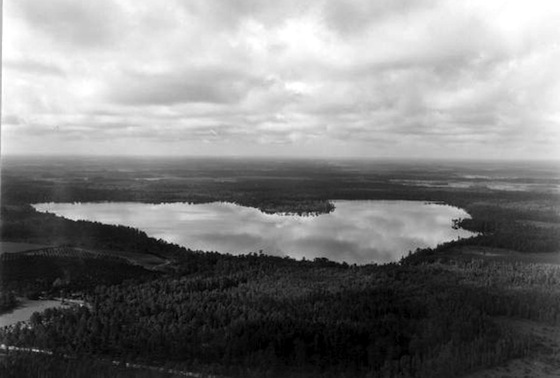 Disney would later use its reputation for success and the location/size of their landholdings to obtain unprecedented power from the Florida government in developing the property. Knowing that the jig was up, Disney decided to come clean. The formal announcement came on November 15th, 1965 in the Cherry Plaza Hotel. Five hundred reporters were on hand, along with Governor Hayden Burns. 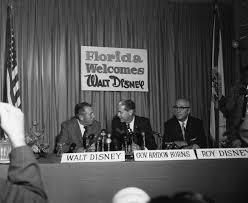 Walt was somewhat vague and anticlimactic during his announcement, projecting an opening date in 1969 and promising an initial $100 million investment. Governor Burns called the date the "most significant in the history of Florida." Everyone was focused on the idea of a new Disneyland in Florida…everyone except Walt that is. He had something much bigger in mind. Tragically the full vision would never come to pass…he wouldn't live to see the first shovel in the ground. Mr. Potter writes: "Everyone was focused on the idea of a new Disneyland in Florida…everyone except Walt that is. He had something much bigger in mind. Tragically the full vision would never come to pass…he wouldn't live to see the first shovel in the ground." Thank you so much for that amazing, informative article. I liked how you covered everything without getting bogged down in the details. Really enjoyed it. Great job, I love the old Photos too..